Something irritating is happening within the Future Movement. Whether it is the inspiration of Ramadan or instruction from the Saudi High command, key pro-Hariri MPs seem to be repeating different versions of the same message: It is time for the Sunnis to hit back. Ghinwa Jalloul, a prominent female MP recently insulted a significant proportion of the population in an ill-fated speech claiming ‘Beirut for the Beirutis’ to which a puzzled Waleed Jumblatt responded with a proto-scientific question? ‘Do we need DNA to determine who is a Beiruti?’ It seems ludicrous to suggest that in a small country like Lebanon, which suffers from an uber-centralised bureaucracy, the capital could suddenly claim a status of ‘Forbidden City’. But when we substitute Sunni for Beiruti and we place Jalloul’s words into the context that sees Hariri vying for support among the Sunni masses we experience a moment of revelation: So Beirut has essentially a Sunni identity... just like Tripoli and Saida. Only a few days earlier, Tripoli MP Mohammad Kabbarah had announced solemnly that Tripoli was ‘the capital of the Sunnis’. A fascinating statement that authorities in Cairo, Damascus and Baghdad, not to mention Riyadh, are likely to refute. 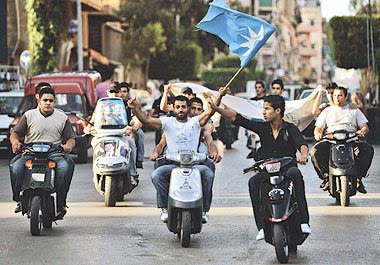 The Lebanese Sunnis approach to politics has always differed from other sectarian groups. Essentially conservative and reluctantly militant, they were uncomfortable with the Left and proportionately underrepresented in the political parties of the National Movement. Inspired by Nasserism, their true loyalty lay with the traditional merchant families of Beirut, Tripoli and Saida. That is until the Hariri machine’ systematic onslaught on the established hierarchy within the community. New money powered by the Saudi Kingdom trumped the comfortable network of Beyks who had played an important role in establishing the Lebanese entity during and after the French mandate. The late Rafik Hariri, love him of loathe him, rose from obscure Saudi protégé to a Lebanese figure that transcended the sectarian divide until his assassination in 2005. Today the Future movement, headed by his son Saad, has lost all national dimension and can only hope to recapture the Sunni heartland, plagued by disillusion and the Islamist temptation. While this process had slowly been evolving since the 2007 confrontation With Hezbollah-Amal in Tarik Jdide, the comments heard over the past few weeks signal a turning point in the mediatic approach adopted by the movement. In their efforts to counteract Shiite self-assurance through the strengthening of Sunni cohesion Hariri and co might get more than they bargained for. Somehow reading your article makes me think of the term : "Douwaylat Saghira". With the Sunnis deciding to go for what all the other sects have done- i.e. the attempt to create a single secterian political movement that represents them in the State- the transformation of Lebanon into a true animal farm (zribeh, ya3ni, ajjalkon) is complete. Mabrouk to all of us!! My entire life in Lebanon was spent in Beirut- nay in the heart of Beirut. My mother was born in Basta, and spent her entire- hopefully long and healthy- life in Beirut. And for good measure, she speaks with a thick Beiruti accent (which I have partly inherited)! Yet, due to my sect I am not allowed to claim I am a Beiruti. Saad Hariri on the other hand was born and bred outside Lebanon, never mind Beirut, and has no roots in the city, yet he has an automatic right to speak for Beirut and its people. I therefore would like to claim- yes you heard it first on Arab Democracy- that I am more Beiruti than Saad! There, it's off my chest! Phew! I think Ms. Jalloul is setting the stage for what some of us believe is a natural progression of what has yet to come: Dividing Lebanon into mini-states. The only problem is Ms. Jalloul is taking ownership of a city that isn't hers to keep to begin with. But then again, did you except anything better to come out of a Lebanese MP (any Lebanese MP for that matter) who was for something before turning against it. There are those that are smart, those that are cynical, a few realists here and there, and of course there are those whose arrogance have led to many an idiotic statement. Alas they have and will continue to populate the Lebanese political community. I for my part am a Londonder by adoption. Cities are about movement, challenge, progress and constant rejuvenation. ms Ghinwa Jalloul fails to understand all these concepts. She is no added value to democracy in Lebanon, as she wasnt chosen as a candidate in the name of women's rights or for her opinions but most likely to make the point that Mr Tammam Salam could be beaten by a woman as long as she was sponsored by the Hariris. Unfortunately, in Lebanon, you don't elect one person but a herd. You've got the good, the bad, and the ugly. Sometimes you only have the ugly.